Baxley City Hall is located at 282 East Parker Street, Baxley GA 31513; phone: 912-367-8300. Photo: C. W. Deen House, ca. 1897, 413 North Main Street, Baxley, GA. Listed on the National Register of Historic Places in 1982. Photographed by user:Bubba73 (own work), 2015, [cc-by-3.0 (creativecommons.org/licenses/by/3.0)], via Wikimedia Commons, accessed November, 2015. The city is named for Wilson Baxley, a farmer who came from South Carolina. In the 1860s he opened a general store. He sold a right-of-way near his store to the Maxon and Brunswick Railroad, which built a railroad stop here with the non-nonsense name of 'Station Number 7.' The railroad was completed in 1870, and by 1874 Baxley replaced Holmesville as the county seat. 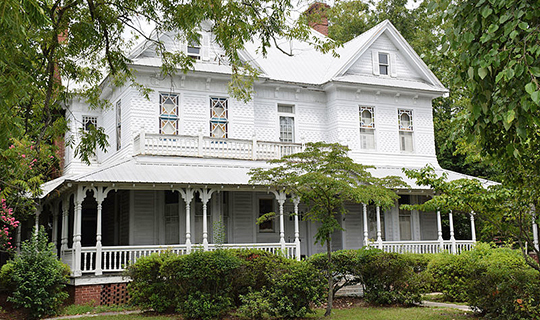 Baxley was the home of author Caroline Miller while she was writing her Puliizer Prize winning (1934) Civil War novel, Lamb in His Bosom. The Appling County Courthouse (Courthouse Square), the Citizens Banking Company (112 N Main St), the C. W. Dean House (413 N. Main St), and the Post Office Building (124 Tippins St) are four Baxley properties that are listed on the National Register of Historic Places.